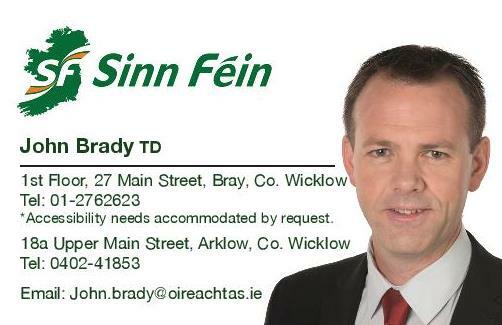 Sinn Féin TD for Wicklow/East Carlow John Brady TD has called on Minister Harris today in the Dáil to provide funding for crucial cancer support services in County Wicklow. “Today, I raised the issue of the need for proper Government funding for cancer support services if these services are to survive. I highlighted the scenario currently faced by Purple House Cancer Support in Bray who are consistently depending on the goodwill of the people of Wicklow to fund their vital services. “This is totally inadequate and furthermore it is totally unsustainable. The work done by Purple House Cancer Support is crucial, the services they provide through counselling, advice and guidance and transport services for people attending hospitals for treatment. “In Ireland, we know that every three minutes, a person is diagnosed with cancer. We also know that every year there are more than 165,000 people living with and beyond cancer. In 2016 alone, Purple House had more than 1,200 people visit their Cancer Support Centre in Bray and outreach support service in Dun Laoghaire. “Purple House Cancer Support services not only serve the needs of people living with cancer in the community, they also compliment the implementation of wider Government policy on social inclusion, health promotion and strategic cancer supports. Yet, the funding provided by the Government does not reflect all of this work.